Anushka Sharma is an Indian Film Actress, Model and Film Producer. She was born 1 May 1988 in Ayodhya, Uttar Pradesh, India. Anushka Sharma is a very popular Bollywood Film Actress. she is currently one of the leading & commercial successful and one of the Highest-paid Actress of Bollywood. Anushka Sharma has received Several accolades including one Filmfare Award from Seven Nomination. She was made her debut with Shahrukh Khan blockbuster Hit film Rab Ne Bana Di Jodi (2008), which won her Filmfare Best Actress Award. She had her biggest commercial successes with the roles of a television reporter in the religious satire PK (2014) and a wrestler in the sports drama Sultan (2016), both of which rank among the highest-grossing Indian films. Anushka Sharma's other commercially successful popular movie are Band Baaja Baaraat (2010), Jab Tak Hai Jaan (2012), NH10 (2015), Ae Dil Hai Mushkil (2016) etc. Anushka Sharma now shooting for upcoming Bollywood Movies Sanju which is Sanjay Dutt Biopic (2018). Other upcoming project is comedy-drama Zero, co-starring Shah Rukh Khan. Anushka Sharma was born on 1 May 1988 in Ayodhya, Uttar Pradesh. Her father, Colonel Ajay Kumar Sharma, is an army officer, and her mother, Ashima Sharma, is a homemaker. Anushka Sharma was raised in Bangalore. She was educated at the Army School there, and received a degree in arts from Mount Carmel College. In 2007, she made her runway debut at the Lakme Fashion Week for designer Wendell Rodricks's Les Vamps Show and was picked to be his finale model at the Spring Summer 2007 Collection. As of September 2014, Anushka Sharma is pursuing a Master of Economics degree through correspondence. Apart from acting, Sharma supports a number of charities and causes. She walked the ramp to support Shabana Azmi's Mijwan Welfare Society, an NGO that helps empower women. She supports various charities and causes, including gender equality and animal rights, and is the co-founder of the production company Clean Slate Films. 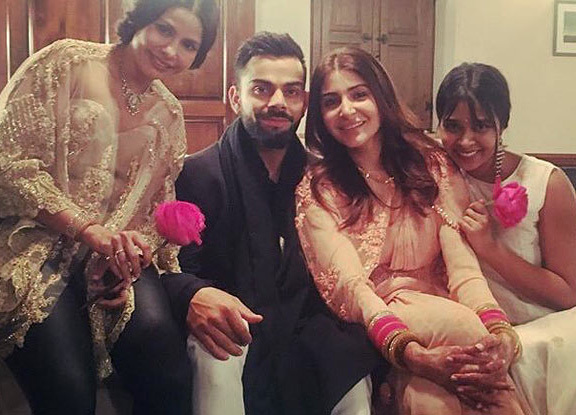 Anushka Sharma is Married to Cricketer Virat Kohli in 11 December 2017. Actress Anushka Sharma and Virat kohli has affair for a long time and they got married in December 2017. Anushka had affairs with Zoheb Yusuf and Ranveer Singh before. While paying her homage to Late Dr APJ Abdul Kalam on twitter, she misspelled his name as "ABJ Kalam Azad". After it, she was criticized on twitter and she deleted that tweet and posted another one, which was again wrong as she wrote "APJ Kalam Azad". At the third attempt, she finally tweeted it correctly i.e. "Dr. APJ Abdul Kalam". There was a rift in her relationship with Virat Kohli for a while in the early 2016. If reports are to be believed then the reason behind it was that Virat invested a good amount of money in Anushka's film Bombay Velvet, which unfortunately failed at the box office. And, when Virat asked about the money loss to Anushka, she felt upset. Virat even unfollowed her on Twitter and Instagram, but after few months they got back together. Hometown She basically belongs to Ayodhya, Uttar Pradesh but she grew up in Bengaluru and now she is settled in Mumbai.